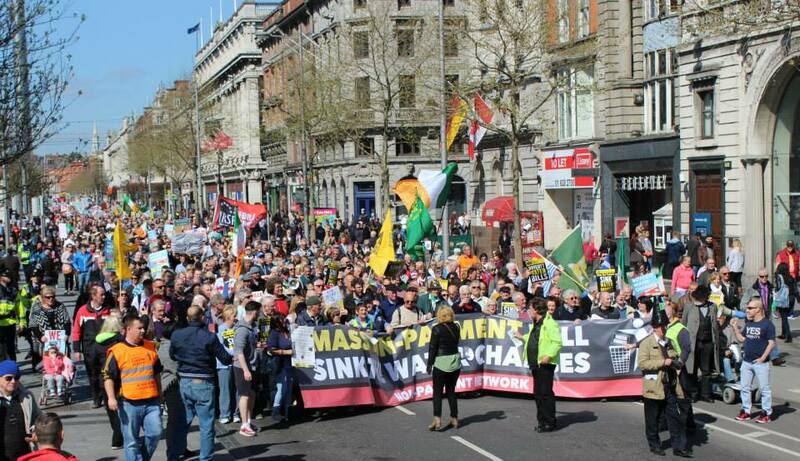 The strong turnout for the protest organised by the Non Payment Network on 18 April after the huge 21 March anti-water charges demonstration in Dublin was another graphic illustration of the strength of opposition to this hated austerity tax. With the first bills being sent out by Irish Water in April and May, the struggle is now entering a decisive phase. In households and communities up and down the country, discussions will take place about paying or not paying. Right2Water called the first major demonstration on October 11 and came to be seen as the co-ordinator for national actions. Right2Water has played a very important role and people have responded to the actions it called again in massive numbers on November 1, December 10 and March 21. As the bills come out many will look towards Right2Water for a lead about what to do now that the government is continuing with this charge. The Anti-Austerity Alliance, along with other parties and groups is part of Right2Water, as well as five trade unions – Unite, Mandate, the CPSU, the CWU and Opatsi. 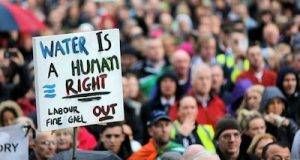 Those unions involved in Right2Water have initiated a meeting at the start of May to discuss a “Platform for Renewal” which is geared towards the general election, including the possibility of standing candidates in that election. The idea underpinning this seems to be that the struggle against water charges has now shifted to the political plane and that ultimately, the abolition of water charges can only come about by a political decision of parties in government. But that immediately raises the critical question, what extra push will force those parties into the abolition of the charges since the establishment parties are still intent on keeping them even after four magnificent demonstrations and thousands of local protests and actions? This is a very concrete question, completely connected to the levels of payment. If a majority are not paying the water charges before the general election, it is not certain, but likely that water charges would have to be abolished by whatever government comes in. The water charges would have passed the point of being politically credible and it is unlikely any new government could impose a charge that a majority are not paying. However, if a significant majority pay the charge, the political pressure from below on all the parties will decline dramatically. Fine Gael, Fianna Fail and Labour’s support for water charges will be reinforced. Sinn Fein’s commitment to get rid of them, forced during the Dublin South West By-Election, could be ‘pragmatically’ reviewed. In any case, in these circumstances it is likely that in the horse trading about forming a government, water charges would remain as important vested business interests want them as well as pressure from the European Commission. Payment levels will therefore be crucial in determining what happens politically regarding water charges. We share Right2Water’s goal of abolition of water charges but in order to achieve that, we believe we need to build mass non-payment, starting immediately. We have raised this privately but now it is appropriate to make the appeal public. The campaign for mass non-payment would be enormously strengthened if Right2Water altered its approach and from now on publicly advocated that people shouldn’t pay this unjust charge. An opinion poll from the middle of February indicated that 40% of people intended to pay the water charge; that 30% would not pay; that 20% said they “didn’t know” or “it depends” and 10% said the charge wasn’t applicable. If people were asked whether they wanted to pay or support this charge, it is very likely a significant majority would say ‘No.’ This situation is crying out for leadership. If the actual opposition that exists could be turned into non-payment, this charge would be history. There is huge potential to build majority non-payment based on the hatred for the water charges and the fact that the government was forced into hugely minimising penalties for non-payment. Many will not pay in principle, but now others who are opposed but fearful could be won to non-payment as a tactic. A person can refuse to pay for over a year and will not face any financial penalty. Legally the next General Election must be held by April 9 2016, so that means everyone can successfully withhold any payment in protest until the election at least. This is a great opportunity – to use the absence of serious sanctions to overcome fear and to build a mass movement of non-payment that peaks precisely at a decisive time politically – in the very midst of the General Election campaign. This information regarding penalties and how non-payment does not result in financial penalties needs to be brought into every community and every household. It was an important factor in why the Civil and Public Services Union, one of the unions at the centre of R2W, recently adopted a position that people should not pay anything before the General Election. Undoubtedly the vast bulk of those demonstrating on October 11, November 1, December 10 and March 21, who supported Right2Water calls to action, will not be paying the water charges. There is a clear opportunity here for the unions involved in Right2Water to advocate an approach of non-payment, one which could make all the decisive difference in defeating this rotten austerity charge and save their members hundreds of euros a year. This should be embraced as it’s in the best interests of their members and the working class generally. It would totally transform the situation if every organised group involved in Right2Water, including the five trade unions, launched decisive calls that the most powerful weapon householders in every corner of the country have to undermine and bring down the water charges is by a blank refusal to pay, a massive nationwide boycott. In addition, they could urge all groups and individuals fighting the charges to go into their communities, workplaces and families to actively argue for this. That is a key lesson from the anti-water charges campaign in the ‘90s when such an organised movement of people forced the then Fine Gael / Labour Coalition to announce the abolition of water charges in December 1996. This is so simple and clear that any group not prepared to do so should explain why not. As none of the major political parties represents the interests of working class people, the AAA has been trying to help the political organisation of ordinary working class people in many different communities. Representatives from the AAA, which itself came out of the campaign against the Household Tax, have publicly made the call that the broad anti-water charges campaign should stand a slate of candidates in the general election. Therefore we welcome the idea put forward by the unions involved in Right2Water of advocating a political programme on key issues and of discussing the establishment of an electoral challenge. We believe it is correct and timely for trade unions to take such a political initiative, in conjunction with industrial campaigns to enhance the living standards of their members. We think any electoral challenge coming from the anti-water charges movement needs to be connected to the struggle to build mass non-payment in the communities, as that is the key phase the struggle is at and can’t be ignored. Majority non-payment when the election comes round is the ultimate way to ensure the charges are defeated and standing candidates will help maximise the non-payment figures and the pressure on all the parties. We believe an electoral challenge and mass non-payment can be merged to the benefit of both. However, as of now Right2Water has not decided to advocate non-payment and many of the driving forces involved seem to see the electoral challenge as separate from this decisive phase of the campaign. The focus is now on the conference it will hold in May and June to launch its political and electoral initiative. The conference is due to be limited to a couple of hundred people, split evenly between political parties, the trade unions and communities. In contrast, if R2W lent its name and authority and worked in conjunction with other groups and campaigns active in the areas, very large meetings could be convened involving many new activists in each constituency over the next months. These could then democratically select representatives to attend the conference in June which should be opened up beyond the original 200 envisaged to attend on 1 May. Very vibrant campaigns could be launched which could win majorities for non-payment and at the same time could agree local democratic processes for selecting activists as candidates to represent the struggle against water charges and austerity. 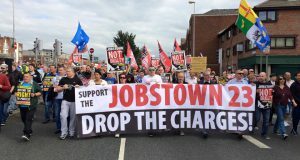 Due regard should be given to individuals, groups or parties that have a political basis and a record of fighting locally, but undoubtedly the struggle against the charges and to build of a new working class genuine left would be massively strengthened by the active involvement of as many people in the communities as is possible. Such is the space that is opening up, not only could many working class activists be elected as TDs, but also a new mass fighting, political movement could be established. It isn’t clear what are the plans to structure or process the electoral initiative or select or endorse candidates. However, we would strongly encourage Right2Water to adopt a non-payment position, work in conjunction with other campaigns and groups and use its authority to help establish a broad anti-water charges election challenge on a democratic basis in as many communities as possible. We agree with the proposal to put forward a platform of demands on the key issues affecting ordinary people as the basis for the election campaign. However, it will also be necessary for any slate or electoral initiative to outline its broader and more fundamental policy regarding the economy, wealth and resources and how such a programme of demands should be paid for and candidates and groups/parties should be asked to sign up to that as well. The media will also require more policy-wise than a list of reforms. This is necessary in order to avoid a situation where some people could sign up to the particular demands, but have other positions which could be damaging to the interests of ordinary working people and which could embarrass or undermine the political initiative before or after the election. For example, there would have to be a commitment to oppose all measures of austerity and all policies that undermine or attack the economic or social position of working class people. Where candidates or groups are not new and have stood before, their actual record would have to be taken into account in order to preserve the credibility of any electoral initiative. While individual members may have played roles in the anti-water charges movement, as a party, Sinn Fein has not seriously used its resources to really fight on this crucial issue in the communities and still refuses to call for non-payment, which inevitably will be a major issue in the General Election campaign. An electoral initiative constructed off the back of the anti-water charges movement, that gives the stamp of approval of that movement to a party that hadn’t seriously fought on the issue would not be understood by the activists who actually had fought in areas up and down the country. Sinn Fein implementing austerity in the north and justifying it on its own terms is also material to this as it gives a strong indication of the approach they would adopt if in government in the south. They may have belatedly raised issues regarding the Welfare Bill in the north, but they have also indicated that they expect to sign up to that reform. Sinn Fein recently agreed to the loss of 20,000 public service jobs in the North and the inevitable impact on vital services people depend on. What type of policy and government is required? The next election is likely to result in a new configuration of parties in government. All the indications are that it will either be a version of a grand coalition, where Fine Gael and Fianna Fail come together to rule or Sinn Fein will lead Fianna Fail and possibly others in government. However, ultimately a more significant outcome of the election would be if the anti-water charges movement can come together on a principled basis to get many TDs elected. Given the sell-out of Labour that would be a huge breakthrough for the trade union movement and working class people generally and would put on the agenda the prospect of fighting for a genuinely anti-austerity and anti-capitalist government in the years ahead.